definitely one of the prettiest snacks I've seen! Snacks are awesome. You all know how obsessed I am with egg waffles in Hong Kong and that got me thinking: there must be unique and fabulous snacks around the world that I don’t know about or haven’t eaten. So I put a call out to a bunch of bloggers asking them what their favourite snack is. I got way more responses than I bargained, but all are so great that I’ve to put them all on. Originally, I planned to add a few of my own, but now I feel like they’ve done the world justices. Given the long post, I’ve grouped them by continent to make it easier for everyone! definitely one of the prettiest snacks I’ve seen! A Breton specialty from Brittany, the Kouign-Amann is even tastier than it looks (which is difficult to imagine, I know!) A little like a puff pastry, the Breton cake has been around since the 19th Century. It’s so rich that you can only really eat one at a time; 40% dough, 30% butter and 30% sugar makes this the perfect sweet treat! Although the most popular flavour is original (just butter), the pastry is also available in other flavours like apple and raspberry. These delicious German treats are most often found at the Christmas markets but are also available from the supermarket year-round. It literally translates to ‘Chocolate Kiss’. They consist of a creamy, marshmallowy centre on a wafer base covered in chocolate. The centre is actually sweetened egg white foam and come is a variety of different flavours. After copious trips to the Christmas markets last year I managed to try Peppermint, Bailey’s, Mocha, Caramel, Mulled Wine and Coconut. You can buy them individually or in boxes to take home. Who wants a schmalznudel? My favorite snack that I’ve discovered on my travels is schmalznudel from Munich, Germany. This delicious treat is a cross between a doughnut, a danish, and a croissant, and is good enough that I’d go back to Munich just for another taste! The round piece of dough is fried and then quickly tossed in a mixture of cinnamon and sugar. They’re made to order, so you get to dive in while it’s still nice and hot. The next time you’re in Munich, head to the tiny Cafe Frischhut, which is just around the corner from the Vikualienmarket, and order one (or two or even three–I won’t judge!). tasty burek can save you pennies by being cheap! Every time I think back to our trip in the Balkans, mouth-watering images of the ubiquitous snack burek come to mind fuelling my cravings for the delicious savoury pastry. Burek is a pie made of filo pastry traditionally filled with meat or cheese, which is very common in many of the ex-Yugoslav countries. It comes in many variants – the burek we tried in Croatia was served as a slice out of a larger pie, whilst the one in Bosnia was rolled into a spiral. Burek is a favourite snack for many travellers around the region, not only because it is very easy to eat when on the go, but also because it is very affordable and filling – perfect for those travelling on a budget! Pasties are a go to snack/light meal all over the UK (thanks to the chain Greggs) but they are specifically linked to Cornwall, the south-west corner of England. A pasty is simply just a filled pastry, similar to a chicken pot pie, but less messy and easier to eat by hand. The filings range from cheese & onion to steak to a vegetable medley; my favorite will always be cheese & onion! I particularly love pasties for a quick snack as I am getting on the train or back into the car for a journey. While I usually end up with crumbs all over me, it’s nice to have a fresh, warm snack. I also love trying to find incredible pasties in little bakeries. Like any common snack, there are plenty of chains, but there are also plenty of local bakeries that take on their own interpretation of the pasty. It’s always fun to find these places and see what different and unique fillings they offer. While I usually stick to cheese & onion, I had my first steak and potato pasty the other day and I was not disappointed! Cute little snacks – I feel like I’d eat half a dozen of these without realising! Some of my favourite snacks that I discovered while traveling were the pastizzi, in Malta. The pastizzi are small filo pastries filled with either ricotta cheese or mushy peas, and then baked. The filo pastry is made by hand and the people who make them usually wake up very early and spend a couple of hours just with making the dough, so that it melts in your mouth. Depending on what their filling is, the dough is folded in a different way. You can find pastizzi everywhere in Malta and they are very cheap, around 35 cents for one. The best place to buy your pastizzi from is the Crystal Palace, in Rabat. It’s easy to miss, because it’s just a whole in the wall, but their pastizzi are said to be the best on the entire island. The place is so famous that when the owner decided to close it down, people started to protest in front of his shop. Pastel de Nata or Egg Tarts are perhaps the most popular snack of Portugal. These pastries are slightly sweet and are delicious! You will find them at cafes literally all over Portugal and they can be as affordable as a Euro. Not just snacks, but these egg tarts are perfect for a light breakfast with coffee. While I was in Lisbon, I started all of my days with them and ate them again with my evening tea. Sometimes the simplest things are the best, the Catalan tomato bread you can try during your visit to Barcelona, is a good example of that. This simple snack is one of the foundations of the Mediterranean diet, and actually you can find “pa amb tomaca” as they usually refer it, in the whole Spanish territory. It is made from a slice of bread, in which they scrub a mature tomato (the tomato to be a special type and mature is very important), and then they add olive oil and some salt on top of it. Some people also scrub garlic on the bread, but this is optional. This snack can be eaten alone as a snack or to accompany tapas, ham and other food. I simply love it, since you can eat it in any moment of the day just to give you some energy, and differently from many other snacks, actually it’s quite healthy. Francesinha (which means frenchie) is a Portuguese sandwich originated in Porto made with toasted bread, ham, several types of sausages, steak or roasted beef, covered with melted cheese and a hot thick tomato, beer and peri-peri sauce. As if that wasn’t enough, it’s usually served with french fries and a fried egg on top. It’s supposedly a Portuguese variation of croque-monsieur and it quickly became a signature snack of many Porto restaurants and a reference of the city itself. What really defines the quality of the Francesinha is the sauce and the quality of the meats used. There’s nothing better than a churro satisfy your hunger when strolling the streets of Spain. Served by street vendors and cafes across the country, these tasty treats are a type of deep-fried pastry that is crunchy on the outside and chewy on the inside. And if that isn’t enough, most vendors offer a cup of hot, creamy chocolate that you can use to coat your churro. While dark in color, the chocolate is more sweet than bitter. Churros cost just a few dollars and are the perfect mid-day snack or after-dinner dessert. In addition to Spain, you can find them in many South American and European countries, from Portugal to Peru. Anyone up for some Dutchies snacks? Drop or liquorice (alternatively, licorice) is the favourite candy of the Dutchies. Outside the Netherlands, people react sceptical whenever offered some, and if they are brave enough to try, they usually cannot spit it out quickly enough. And yet, there is something about it that we love: sweet, salty, hard, soft, fruit flavoured or black: we love them all equally! They come in many different shapes, from animals (cats, bears, fish, anything you can think of really) to stars, balls and triangles. With such a large variety of options, there will always be a drop type to your liking. That is, if you’re Dutch. One of the best things about moving to Germany was the large variety of new drop types available in supermarkets here, because yes, the Germans like drop too! That sweet sensation of shelves full of drop not yet tried, walking into a new supermarket I always find reason for enthusiasm. But however well the Germans make their liquorice, nothing beats the drop back home. Drop is great, trust me. Just be careful not to overdose: there is a thin line between eating just enough to satisfy your appetite and feeling completely sick because you had too much. I learned that the hard way as a kid, and so probably will you. That is, if you dare to try! Who says camera has to eat first? When we visited Amsterdam last year I fell in love with stroopwafels. You might think from the name that they are a version of the delicious waffles found in Europe, but they are in fact a cookie. Thin waffer-like waffles with a gooey caramel filling make for the perfect snack. Eat them like the locals by balancing them on top of your coffee or tea and letting the steam warm the filling. I have a feeling these are not the healthiest snack, but just try to eat only one! You can find stroopwafels in Dutch bakeries, cafes and grocery stores and I have even found them here in Australia. Strangely, while stroopwafels were a bit hit with the adults in our family, the kids got tired of them quickly. You can read more about our recommendations for Amsterdam with kids. There is no one reason why we love the langos. A very popular street food, it literally charmed its way into our stomachs. The concept is an open sub & pizza hybrid wherein there are assortments of toppings and sauces you can add on to the base. In the case of langos the base is a deep fried dish in itself which looks and tastes very similar to an Indian bread called bhatura – the closest reference point we had for something like this. During the length of our stay we tried it with a variety of toppings with the usual share of hits and misses. We’ve discovered sour cream and cheese work very well and so do the usual veggies + cheese combo. We’re vegetarians so haven’t tried the meat options but judging by what the people around us ordered, both vegetarian and non-vegetarian options were equally in demand. It was the find of our trip to Budapest and surely one of the best vegetarian street food options outside of India. If you want to know more about Budapest from them – head to their blog! Certainly one of the more interesting cities I’ve traveled to during my many road trips across the USA, New Orleans never ceases to surprise me with a totally new experience. Easily gaining itself a title as one of the world’s most captivating cities, and home to a diverse collection of people, culture, and food, there’s one thing that every person traveling through the city must try out: a New Orleans beignet. But you can’t have just any beignet because, if you’re going to do it right, you must sample one at the Cafe Du Monde just off of Decatur St.
As the original french coffee stand constructed in 1862, the Cafe Du Monde knows how to create a french beignet. Served in orders of three, these original fried fritters are a bundle of joy and best served as a treat covered in powdered sugar with a cup of joe to wash it down. Feeling a little more adventurous? Try the ones with fruit. Either way, you’ll find yourself hunting down french beignets daily as you go about exploring New Orleans! Ronald talks more about eating safely on the street on his blog here. Açaí is an essential snack to enjoy in Brazil that is usually completely different from any açaí product you have had outside of Brazil because the main ingredient is actually açaí. Açaí bowls (Açaí na tigela in Portuguese) or smoothies are extremely refreshing and energizing to give you an extra boost and cool you down in the heat. Guarana syrup is a common ingredient that has twice the caffeine as a coffee bean that slowly releases for a lasting boost. The Açaí itself if full of antioxidants and contains fiber and heart-healthy fats. 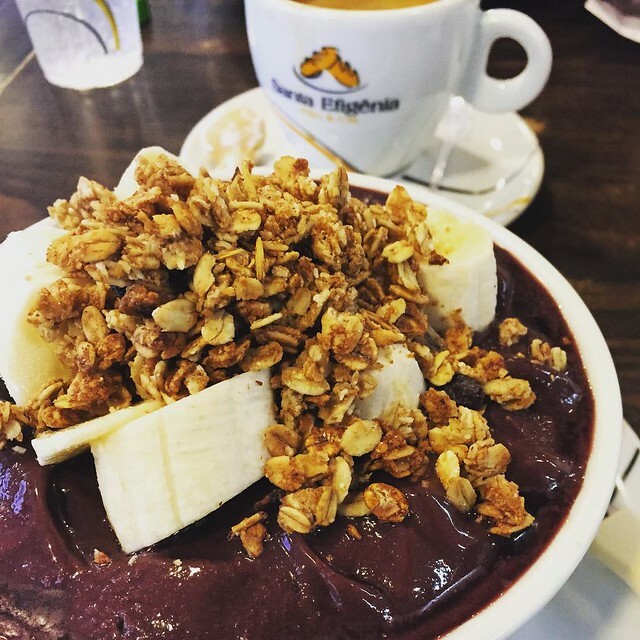 For flavor, Açaí on its own does not taste great, but with Guarana syrup and banana blended in it makes for a yummy breakfast or snack. It is quite difficult to travel to Mexico and not see or at least hear about the infamous elote. Elote (corn) is typically served late at night either at a street stand or from a small vehicle painted like an ear of corn. This famous Mexican snack skewered and covered in mayonnaise, cheese, chile pepper, and lime. You can eat your elote the traditional skewered way or have your kernels stripped from the cob, stuffed in a bag of chips and topped with all the best toppings. Both are extremely delicious and an obligatory experience for your trip to Mexico. Fortunately, BeaverTails have very little to do with real beavers. These sweet treats are pastry covered with various toppings in the shape of a beaver’s tail. They were invented in Ottawa back in 1978 and can now be found throughout Canada. The pastry used is always whole wheat (so you can at least try and pretend it’s healthy) that’s hand-stretched and cooked fresh so it’s nice and hot. The original topping is sugar and cinnamon (my favourite!) but you can also get really indulgent with the Triple Trip, which includes chocolate hazelnut spread topped with Reese’s Pieces and peanut butter! I love the warm, flaky goodness of a BeaverTail and there’s nothing quite like it I’ve found elsewhere! Peneram is Malaysia’s version of the donut. With the recipe originally hailing from India, Indians refer to their donut version as adhirasam. But Malaysians have several names for the tasty treat and that may vary from state to state. Denderam, peniaram or cucur peneram for some and kuih peneram and coq meneran for others. The names may be confusing but the shape and taste are unmistakable. Simply made of rice flour and palm sugar, the peneram dough is rolled out and cut into ‘donut-shapes’. Then deep fried in a wok for 2-3 minutes and wah la! It may not be the most attractive of sweets, but these not-too-sweet, bite sized morsels can be very addictive! More on must try food in Langkawi on her blog! Exploring the Kyoto’s Nishiki Street Food Market in Japan, you’ll see so many weird and wonderful types of food. To begin with, it’s great to just walk the full length to check out what they have on offer. One of the stalls that caught my attention had ‘Octopus on a Stick’, I have to admit their appearance tempted me straight away. I love trying new foods and after walking up and down a couple of times I braved it and bought my first Octopus on a Stick! The taste was amazing, there’s a sticky sauce on the outside which is a little bit sweet and then as you bite in there’s a little surprise (a nice one I might add). Another delicious shopping snack whilst you’re on the go! If you want to follow Becky’s Japan adventure, you can do so here. Want some steamed buns? Bet you do! The oyaki are made with buckwheat and filled with different local ingredients. They generally always have the local fermented vegetable Nozawana in them, and there are also red bean versions, and apple which Nozawa Onsen is famous for, as well as a mushroom mixture. Steamed buns are the comfort foods that everyone associates with Nozawa Onsen, Japan. More reasons to visit Onsen can be found on his blog! Kaipen is a hugely popular snack in Laos, and rightly so. Originally from the city of Luang Prabang, Kaipen is a crispy snack made from green river algae which are still being picked by hand from the Mekong and other rivers. The algae are pressed into thin sheets, dried and sprinkled with sesame seeds. Other vegetables are often added to the somewhat bland algae, creating different flavour combinations. Typical combinations include garlic, onion and galangal. The sheets are then flash fried to create a delicious savoury and crispy snack that is usually eaten by hand. Kaipen is often sold as street food served with a smoky chilli dip and goes incredibly well with a cold Beerlao and some Luang Prabang sausage. A perfect afternoon or pre dinner snack! Try something new at Sri Lanka! One of the most unexpected foods I have found in Sri Lanka was a snack called achcharu. Achcharu refers to fruits or vegetables cut up into pieces and mixed with spices or pickled. While pickled and spiced vegetables are nothing new to me, fruits like pineapple and mango served with chili flakes came as a surprise. Achcharu is sold at the oceanfront by street vendors and at roadside kiosks. Give it a try when you visit the little island in Indian ocean, but be aware that it can be extremely spicy! Head to her blog if you want to know more about what to eat in Sri Lanka. I picked Solid Masti not really because it was my favourite snack in India, but because it has “solid” connotations attached to its name. I stumbled across this saucy snack with some Kiwi friends of mine (I’m Aussie) and we had a hearty laugh about it for a good wee-while. Giggling like silly schoolgirls at a bar in Pushkar in Rajasthan. For anyone who doesn’t get it… ‘Masti’ is slang for… Um… Pleasuring yourself. home made Medu Vada – nom! “Medu Vada” is a local snack unique to Tamil Nadu, India. It is so famous that you can find it on the menu of any high-end restaurant as well as on the street-vendor stalls too. is one of the most tasty snacks that gives quite a boost to your energy with its high protein levels. It is common for people to have Medu Vada along with a plate of Idli for breakfast every day. Medu Vada is made of just three ingredients. So, obviously, the recipe is super simple. This snack’s main ingredient is black gram locally called urad dal. Black pepper increases your immunity to common cold. You can find its recipe here. One of the foods I truly enjoyed eating in Jerusalem is falafel. I had tried them many times around the world, but there’s nothing like having them in the place where they are part of the local cuisine. These typical middle eastern food is a mixture of ground chickpeas with parsley and garlic, which are then balled up or made into patties and fried in boiling oil. They can be eaten alone (which is my favorite way of eating them); but they are also served in sandwiches with other fillings such as mixed salad and various sauces (the best one is tahini); or in “mezze” (appetizers) trays along with hummus, baba ganouj, olives and pita bread. More good places to eat in Jerusalem on Claudia’s blog. One of my favourite things to do in Jerusalem is going to Machane Yehuda, a cool food market during the day that becomes a nightlife hotspot after dark, with lots of bars opening where stalls are during the day. Naturally, there’s lots of street food around Machane Yehuda – my favourite of them all is kibbeh, a kind of fried pastry made of burghul and stuffed with spiced ground beef. It’s so delicious, I can’t just have one even though it’s quite oily! The reason why I love it so much is that it’s the perfect pick-me-up snack while walking around Jerusalem and it’s full of all the lovely Middle Eastern spices I love so much. If you’re planning to eat kibbeh while at Machane Yehuda, just look for the biggest crowd – if locals are there, food is going to be tasty! As part of Yum cha at a Chinese restaurant, I tasted the mango pancakes for the first time. I had never heard of mango pancakes before. Cold, mango custard flavored, buttered and fried pancakes with the whipped cream and sugar are the most delicious pancakes I have ever eaten. They were mouth-watering and very tasty. Even though mango pancakes are available in all the cities in Australia, it seems to be very popular dessert in Sydney. Mango pancakes also serve as one of the best brunches. They are appetizing and fulfilling. When looking for a classic New Zealand treat you can’t go past ‘Pineapple Lumps’. They may sound weird to any foreigners but these delicious lumps of goodness have firmly established themselves as a kiwi favourite. A chewy, soft, pineapple-flavoured centre encased in chocolate is in an odd combination but trust me, it works. Any given packet can range in chewiness from casual munch to stuck in your teeth for hours, it’s just luck of the draw. They are even made using real pineapple juice. A perfect snack for any road trip, movie night or study session. I AM STARVING! Wow the egg tarts and stroopwaffles are some of my favorite snacks – what an amazing collection of sweets (and savories). Yum yum! This post has made me SO utterly happy and hungry! Definitely need to hit up Japan and try some steamed buns! Oh my gosh this post a) made me so hungry and b) had me going ‘YES’ all throughout. I’ve had a bunch of these and can confirm – they are amazeballs. I was trying to pick a favourite but thats seriously impossible haha. Burek is unreal though.